From a humble beginning in 1958 of ten Wayne County retired teachers meeting in homes, a chapter constitution and bylaws were drafted under the leadership of Nan Wylie, president. Local dues were $1.00. The chapter met twelve times each year. In 1965, the number of meetings was reduced to seven. The members met in public buildings. Since 1976, luncheon meetings, followed by a program, have been held at the Hawkins Cafeteria in Wooster. One meeting each year is a joint meeting with our Ashland County Chapter friends with hosting duties alternating. 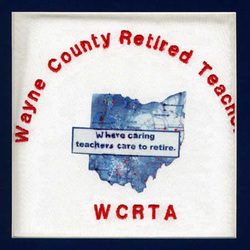 Wayne County Retired Teachers Association introduced helpful yearbooks in 1977 which included current officers, committee members, area senators and representatives, program topics, and a directory of chapter members’ names, addresses, and phone numbers. Spring and fall newsletters began in 1990. Our chapter provides grants to several active teachers biennially for special projects in their classrooms. These grants are funded by contributions from area retired teachers and friends through the Wayne Co. Community Foundation. Under our 2007 president, Juanita Hines, many of our 137 members can still be found serving as tutors, mentors, assisting with Meals on Wheels, helping in hospitals and nursing homes, offering income tax assistance, and being active in local musicals and churches.